Kit and Clowder fb group tomorrow Dec 20th we are doing a name game for the two new cute stamps. Right now they are named winter bear 1 and winter bear 2 and they are available in my 2 Cute Ink etsy shop. 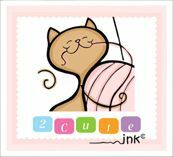 Don't forget that 6 digital stamps are featured in the all about animals coloring class at kit and clowder so it would be a great time to put up those digi's for half off! I hope everyone has a great holiday and gets to spend time with their families!